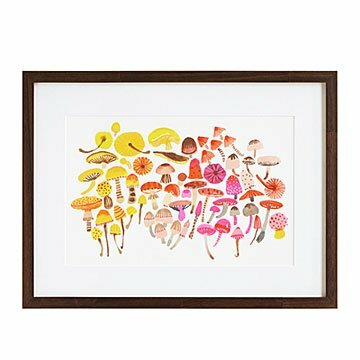 Carolyn Gavin's playfully savory print features an ombre spectrum of mushrooms. Shitakes, creminis, and portobellos have all come to the mushroom jamboree in Carolyn Gavin's playfully savory print. Her lively array of fungi is assembled in a gorgeous ombre spectrum from pink to gold, faithfully reproduced from her original watercolor and gouache painting. Having grown up in South Africa and traveled throughout Europe, Carolyn brings her love of exotic color and natural beauty to this endearing design. The print makes a tempting touch for your kitchen or dining room decor. Designed in Toronto. Printed in Portland, Oregon.